You know what I love? Back to the Future! You know what I hate? Being duped into buying hugely over-priced exclusives! So why I am so shocked that Mattel got me again this year? 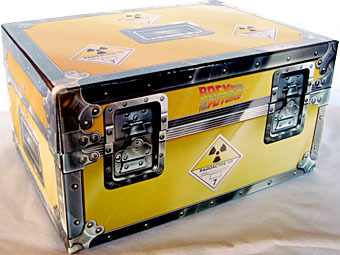 When Mattel revealed their exclusives for San Diego Comic Con 2011 one item was for BttF and it was "so amazingly awesome" all they could show was the packaging, which was a replica of Doc Brown's Plutonium Case in the same vein as the Ghost Trap slipcase on last year's Ecto-1. Beyond that all we knew was that it was going to set us back $35, we didn't even know what kind of product it was at first. Figure? Car? Prop replica? Thus, come pre-order day I went ahead and ordered it gambling on my love of BTTF. It was only after my order was processed that I found they had at long last, and without any fanfare, revealed the contents. And boy did I get jipped. Let me begin by saying I am no car fan or collector. The few I have come from... well, thinking about it, they come exlcusively from Back to the Future, Ghostbusters and Batman. Thus, maybe this is a good deal or something cool to those collectors and fans, but for Johnny Average like myself I'm pretty upset. You see, within the large Plutonium Case box is a much smaller plexiglass case containing the Delorean Time Machine Hot Wheels car, itself also a fraction of that case, in a lame cardboard diorama. And why did this cost more than Queen Marlena ($35), Swamp Thing ($30) and Kilowog ($30)!?!? Each of those feature significantly (if not fully) new tooled sculpts requiring a markedly higher investment. Meanwhile, all this set is is mediocre papercraft, some foam, a cookie cutter plastic case and a reissued metal car. Explain that math to me? Maybe they only made a thousand (in fact they better have! Anything to justify the price!) but we'll never know because Mattel doesn't publish edition sizes, even for limited runs of exclusive product like this. So now we're left with the latest form of dear ol' Matty's famous "gotcha!" marketing/sales plans. And I am all the worse for it. So this set is wildly disappointing, but it's not all bad. 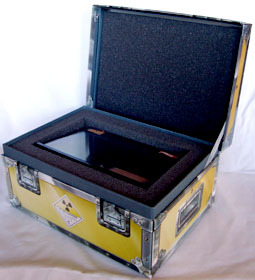 The Plutonium Case is pretty neat. It's printed on similar metallic-sheen paper to the Ghost Trap with the Ecto-1 last year, which gives it a nice, realistic look. It's also reasonably large and the hinge and single-ribbon connector work pretty well, all things considered. The car itself is also a highlight which, upon very close inspection, is fully painted - or at least features far more paint apps than the standard release. Beyond the usual paint flourishes on the mechanics, the aluminum shell of the car has a translucent, dark gray wash while the "flux bar" (I'm sure it has a name) that runs along the base of the frame, wheel-wells, cab and grill has a lighter silver wash. These two simple applications really make the car "pop" visually despite its small scale. And as for the bad? Everything else. While the case is cool and big, it's twice the size of the plastic case holding the car, which does little to increase the value. In fact, the padding gives just that effect - that the box is padded out to hide the smallness of the actual product. Likewise the clear plastic case is quite large, mainly to accomodate the lackluster cardboard flourishes, so this does little but make the case feel more empty. 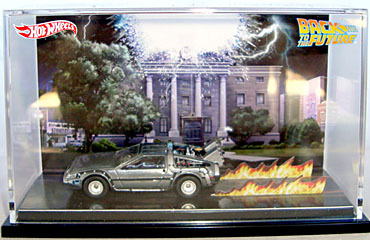 The diorama elements consist of thin cardstock image of the Hill Valley Courthouse Clock Tower being struck by lightning and two little cardboard strips of "fire tracks" behind the Delorean. Conceptually it's neat, but in execution it looks cheap and is outright offensive for $35. At the bare minimum they needed to have done sculpted, translucent orange plastic flames instead of that ridiculous cardboard nonsense. 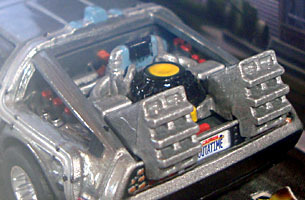 Or released this as a three-pack of the Delorean as modified for each film. Or cut down the package sized and price point. Even though the Ecto-1 was overpriced too, i would have vastly prefered just the cool new paint deco on the Delorean in a simple little display case for $25, just like the Ecto-1. Unless you are the most diehard of all BttF, Hot Wheels, and/or Delorean fans this thing is completely miss-able in every way. Just by the car for $1 at stores or $5 from a scalper and repaint it yourself.